Creative Happiness | Sharing self-help ideas, self-help art therapy & craft ideas. Sharing self-help ideas, self-help art therapy & craft ideas. I’d give anything to be able to create my artwork more often in peace! Life is all too much about money! What wouldn’t I give to be able to use a time machine and go back to hit the person who invented money over the head to stop them! I had a conversation just yesterday about this wish of mine to stop money from being invented, and my husband showed me my error, it’s not money that’s the problem, it’s human greed that’s making me miserable! No one is open and/or willing to help other people. Everyone is too busy looking out only for themselves. Money has too much value these days, let alone being absolutely necessary for general living. You can’t do anything or go anywhere without it! You virtually can’t eat or drink anything without money and you can hardly get any resources without it. A lot of unhappiness comes from the lack of money! The main problems I have with our marriage is due to lack of funds and how we could make my life less stressful and easier. If we had enough financial funds to buy extra equipment that would make my house management easier. We would buy a dishwasher, a good strong medium weight vacuum, we would more easily afford to buy food for the home as I am a really lousy cook. My lack of cooking skills adds a lot of extra emotional stress and trouble between me and my husband. The more I try to become a better housewife and cook, the more I stress over it the more mistakes I make and the more problems we have in getting along. I have panic attacks and other anxiety issues more often and at worse levels and it all starts off more of my Bipolar symptoms. It’s like a never ending cycle of negativity and stress. I really am desperate to try to look after the house and our son and husband better then I am able to. However my desperate efforts go pretty much unnoticed because of my lack of expertise in some of the main the tasks I have to get done in order to look after them. I get discouraged easily from cooking because it’s so bad and we sometimes can’t even eat it. It makes me feel bad to throw away food and it’s against my husbands culture and against both of our religions. When it’s that bad both my husband and I get upset and we become more irritable with each other. He assumes that I don’t try hard enough and that I get too distracted with my “hobbies” and I get sad and depressed thinking that I am not good enough at anything. It can become very emotionally draining and tiring to have to keep fighting over the same topics, fight against your emotions and symptoms and fighting with your family members are both hard to cope with sometimes. Sometimes it can be extremely hard to continue motivating yourself to continue working on improving your emotional and mental health when you have a seemingly constant flood of problems that keep churning up more trouble. I am desperately trying to avoid giving up all together, but what can a person do when they are unable to really learn something important no matter what they do? I have tried almost every idea my husband, I and my mother can think of to get me to learn to cook better. So far nothing has really helped, I even started refusing to answer the phone if I am cooking, but I can’t exactly stop my son from wanting my attention, he needs to be fed etc. © Crafty Divaz, [2012 – 2015]. Unauthorized use and/or duplication of this material without express and written permission from this blog’s author and/or owner is strictly prohibited. Excerpts and links may be used, provided that full and clear credit is given to Crafty Divaz with appropriate and specific direction to the original content. This post is more about the inner workings of the mind and does not focus on my creative endeavours. Why do we all seek success and how do we measure it? How to identify if and when we are successful? Is it an inner struggle or do other people have an influence on how successful and content we feel within ourselves? I want to try to understand why I crave a sense of achievement and why I seek outside acknowledgement? I found a wonderful article online about self acceptance and here are a few things I picked up from it. I need to work on my Self Acceptance, that is a big issue for me that I am constantly working on improving. It is clear that for some reason no matter how hard I work on it I can’t break this one. I’ve been working on it for years and it seems that it keeps creeping back for more of a fight. I thought I had improved my self image and self acceptance a few years ago but it seems that problems in life have knocked it about and I need to re-evaluate and improve on it again. While it helps to fulfil my need to create art is good, it only alleviates my inner pain for short amounts of time and I usually wind up frustrated and depressed again. My following my desire to create art reduces some of the inner pain, as it is apart of my inner desires and follows what my higher self needs. It is only one part of the solution. As suggested in Sacha Crouch’s article (How to Let Go of the Need for Approval to Start Thriving), I am planning on starting a Gratitude or Self Appreciation journal to start listing things I am proud of myself for. This may help serve as a reminder for all the good things I accomplish that I am happy about. I need to work on my self validation, we all need to be able to decide for ourselves that what we are doing in life is ok. We shouldn’t always seek out validation from outside sources, mainly because there is never any guarantee that anyone other then ourselves will be totally happy with how we live our lives. While writing this post I realised my main problem at the moment is my need for validation. It’s driving me to the point of depression when I think about how little validation I receive from anyone in my life. I only have my Mum and two friends here on Facebook that tell me I am good or that agree that I actually achieve anything. It’s making me feel extra worthless when I think about how little of my need for validation gets met. My husband tells me he loves me but he cant stop letting me know how little I meet his needs from a wife, he tells me off when I stuff up and unfortunately I stuff up quite a lot. It must be hard for someone who is mentally healthy to have to face living with a mentally ill person. It’s relatively normal for a person to want to live with someone who is at least as mentally healthy as you are. My husband often tells me he loves me but that it is frustrating to live with me because I have such a bad memory and because I make so many mistakes like missing cleaning duties etc. He says it’s very tiring and frustrating living with someone who is emotionally weak and cries so often and he doesn’t know how to handle me when I am having a bad panic attack or when a really bad depression sets in. I did improve my self worth a few years ago but life seems to keep putting my self validation or self worth into question again and again from my stuff ups and wrong decisions etc in life. For some reason I can’t even remember how I improved my self confidence and self validation the first time. Is it hard up keeping self validation and appreciation or it’s just for me? Ideas from other websites on how to improve your self validation. * Try to to notice how much you judge yourself rather than value yourself. Note this down if needed so that you can keep a track of how and when you judge yourself. * You need to start to noticing and acknowledging your feelings, acts of kindness you undertake, and consciously value them. * Judging yourself is the opposite of validating yourself, and creates inner pain and insecurity. * You need to find and stop yourself from judging yourself as much as possible. You need to learn to trust your self, rather than making others your authority for what is right or wrong for you, and you will start to feel more inwardly powerful and happy. * Try learning how to tune into your Higher Self, your inner conscience, your moral sense of right and wrong. * To be present, grounding yourself and not dissociating or avoiding your emotions, try not to daydream, suppress or numb your emotions. To be present, means listening to yourself. * Acknowledging your internal state and labelling it accurately without self judgement or self negativity. Try to be honest with yourself about how you feel and about when and why it started. * If unsure of how you feel or why, you may sometimes need to guess by going over recent activities and experiences. Think back whether anything happened that may have upset you. If someone else were in this situation how would they feel? You might also guess by looking at what you want to do. If you want to hide, maybe you are feeling shame or fear. Think about where you feel sensations in your body, fear is often thought to be felt in the throat. What direction are your thoughts and emotions taking, are they fearful? * You may have intense emotions, remind yourself that it is normal. Everyone has emotions, no one is happy all the time. It’s also important to acknowledge when others would feel the same way and accept that as well. * An important distinction is remembering you are not your behaviour. If you do something that’s normally against your beliefs, that doesn’t make you a bad person. Somebodies and Nobodies, Why Do We Want To Be Famous? Fame promises an escape from ghettos, both real and imagined. Robert W. Fuller PhD. Posted Sep 25, 2009. How to Let Go of the Need for Approval to Start Thriving, By Sacha Crouch, 2016. Self-Validation, Learn to accept your internal experience and build your identity, by Karyn Hall PhD, Posted Jul 12, 2014. I posted some new items on my Etsy store recently. Still hardly any likes on my Facebook and only a few new followers on my Twitter account and Instagram. A lot of the marketing guru’s suggesting that social marketing is the “big thing” now for advertising and reading more interest in your “business” or “products”. In truth it can be very hard for introverts and people with emotional and mental health issues to get “noticed” and to grow “followers”, let alone getting any sales for products etc., that they try to get people interested in. I may not have the answers as to how to generate “sales”, but I do know a lot about picking up the pieces and trying to continue creative ventures when it seems as though you’re gaining nothing from them. Why can’t I gain Followers? Does it really matter in the big scheme of things if people suffer from emotional or mental symptoms? The real truth, is that some of us simply need the space to vent out our emotions and show our creativity no matter what. Even if creative artists don’t get any real interest in what they create, simply “trying” to get their work seen and noticed can be a huge ego and confidence boost for some people. Sometimes we need the extra push to get out of bed and put some effort into doing something for ourselves. What if I never get a single sale? The truth is, I might never generate a single sale, I might give up on the Etsy store if I don’t achieve any sales from my efforts. I’d probably continue trying to get some interste in my blog though, because this is how I am able to continue getting some satisfaction that my words might possibly help some people. If only a few people read my posts, that itself is helping me to keep my confidence a little bit better. Sometimes that’s all a person really needs in order to keep working on positive efforts. The fulfilment of the need to feel necessary to someone, that feeling that I may actually be able to help some people buy blogging, it can keep me going sometimes when I’m feeling down. The push to continue trying to make a difference for atlas a few people, really helps me put more effort into maintaining my own emotional health. The need to continue pushing yourself in order to be of benefit to someone can be a very powerful motivator. The positive feelings you are able to gain from being able to continue working positively towards a goal aimed at helping people can make a huge difference in your emotional well being. Here is an update on my current projects! This is my first completed art project, an acrylic painting on canvas paper, it’s called Fashion Diva and is available for sale on both bluethumb and on my etsy store. This is a painting depicting my love of fashion and art. I am also working on another acrylic painting on canvas paper, which I am calling Broken wing. For me this depicts my struggle against the outside world. It shows my struggles with other people and how I feel broken down by my bad experiences with people and how they used and emotionally manipulated me etc. So the angel represents me as how I see myself as innocent being wanting to be friends and help people and the broken wing and grey background is to represent the sadness. The broken wing represents how the badness in life in general and in people that breaks my heart. This is how I am using my art to get out some of my negative emotions and thoughts, crating art that depicts how I feel and my thoughts has been a lot of fun and reduces me stress and anxiety to work on things that I enjoy. This is how I have been continuing my self therapy if letting go negativity from inside. 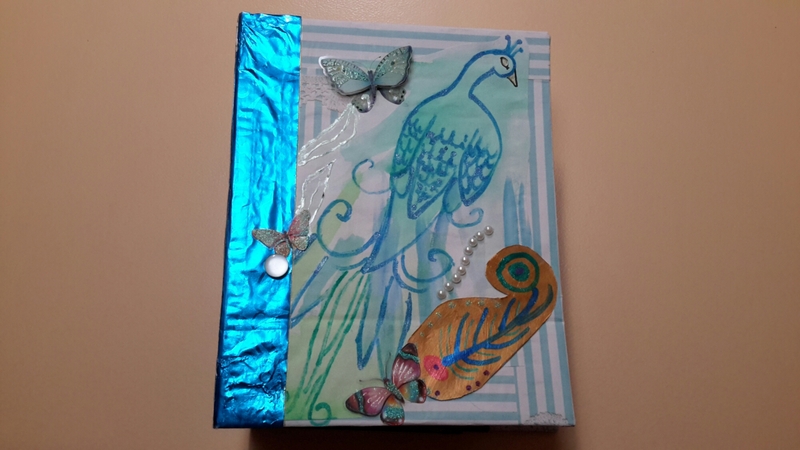 I am also working on creating art journals so I can continue creating smaller works of art and to include quotes and affirmations to help reduce my stress and other symptoms on days I feel bad. How do you use your creativity, do you use it to relieve stress and does it help reduce negativity for you? I create art and craft in order to survive. Whether or not other people like or praise my efforts, I need to continue creating in order to stay sane. For me it’s like a lifeline, it’s what keeps me going on with the struggle. In order for me to keep up my efforts to try to stay “normal”, I need a way to escape now and then from the real world. If I don’t zone out at least once every day for at least half and hour, I feel as though stress and outside negative comments and criticisms become my one focus. I can’t switch off from all the negativity in the world that affects me, critisism and negative feedback from everyone in my life simply become too much for me to handle. There are only a few techniques open to me to try to switch off all the negativity from outside and my art and craft are just a few of them. I either need to read a good novel, listen to music and daydream or I need to create some type of art or craft project. At the moment painting is the main activity I have chosen to try in order to switch out all the negativity around me. I get to concentrate on something that at least a few people are able to give me more positive feedback on. It’s so hard to get other people to understand that I need to have some positive feedback in my life on something that I am good at in order to feel good about myself. In order to get away from my inner negative chatter and to be able to ignore or forget the affects of all the negative critism and feedback I receive from the outside world I absolutely need to let go and get away from the real world for a while. For some reason it’s be very hard to get other people to accept and allow me to continue harmlessly creating my art and craft. I can’t figure out for the life of me why it’s so hard for people to simply allow me to get away from stress for a while. Why is it so hard for more normal people to understand that some of us simply need the little bit of extra attention and positive feedback on something we create in order for us to be happy? Ok so now that I am up and around again, I thought I’d just post a few pictures of my newest projects. Somehow it did help to start painting in darker colours for the tornado, it helps to get out some of the inner negative emotions to some extent. It also kind of feel good to be painting something that more accurately reflects my inner emotions, rather then simply painting something to be pretty. The other two are two girl images, one is a fashion girl image and the other is a ballerina. Mostly for the last few weeks I have been trying to paint with Acrylic paints and using the images and the painting strokes to try to paint out my negative emotions. It seems to work as long as my symptoms are not at the very worst, once I am too depressed I tend to steer away from painting however as my hands are not very steady when I am too anxious and I seem to tend to muck up the paintings if I force myself to paint. I have so far enjoyed working on the tornado image and plan to do more artwork based on my own exercises, both to try to get the benefit of the art therapy itself and I found it fun to try to express my emotions with the art. I will continue posting any other art work I create and will try to focus on the ones related to my art therapy book exercises. I was going to call this post “Potty Training Drama’s” but I didn’t want to scare anyone from reading the post! Ok, so I am just starting to “properly” try training our three year old son, it’s driving me crazy and it’s only been two and a half days. I had no idea that following a little kid around the house trying to clean up little messes would be so stressful. So far we have him happy to sit once in a while on the potty or toilet, at least he’s not screaming about sitting on them now. However we can’t get him to actually use them properly, he seems upset with the idea of doing his mess anywhere but in the nappy. I’ve managed to get him to pee in the potty just a few times but he always has very strong reaction and sometimes cries. We tried to get him used to wearing the underwear as the first day we put them on him he wasn’t too happy it, must miss the feeling of the nappy I suppose. After a while he was ok wearing the underwear but seems to think it should work like nappies and just does his business. Every time I got him siting on the toilet or the potty he’s ok with it for a short time as long as he doesn’t pee. Ok, so today I thought I’d try keeping the nappy on him but I will try to get him to sit on the potty about one or two times an hour. He’s sitting on it once in a while himself with his pants on. I just gotta catch him and pull the pants and nappy down and see if I can get him used to the idea of just peeing in the potty once in a while first. Maybe if I can get him used to the idea of peeing somewhere else besides the nappy we can get something started and then move slowly to the idea of using less nappies per day and move on from there to not wearing nappies? The main problem is that he randomly lets little spurts of pee every so often, especially when he eats, why he pees when he puts something in his mouth I have no idea and it’s going to be the hard habit to change. Any ideas would be lovely at this point as I’m thoroughly confused and stressed out… What to do about teaching him with less stress, I really could do with less extra stress in my life? Why I don’t totally give up on my handcraft activities & my newest project! Hi, it’s been a while since I posted consistently. As usual my mental health, family activities and family issues keep getting in the way, but health and family always comes first for me! I completed a new junk journal for my etsy store, and yes I still do have a small store, even though it has less then 20 items listed! I don’t allow myself to completely give up on it, even though I only get one sale for every five or so months it’s up there! It’s helps so much for uplifting and keeping my mental health in control to know that I am at least trying to give it a go. It helps to have at least one activity that I actually don’t give up on totally… Almost everything else I’ve ever tried in life I always give up on or have been asked to move on from other people. There is just something about knowing that I am still trying to find a way to make the etsy store work that helps keeps me grounded mentally. It helps to know that I have at least one thing in life that I have not yet run away from. Even though the store is not exactly very popular, even just those one or two sales every once in a while help to make me extremely happy and I feel as though I am at least achieving a little of something. That in a life with mental health, is actually quite a big thing, to have something that helps to make a person feel useful even if only sometimes, those days when you do get a positive outcome even if it’s spaced out, help to make you feel good.